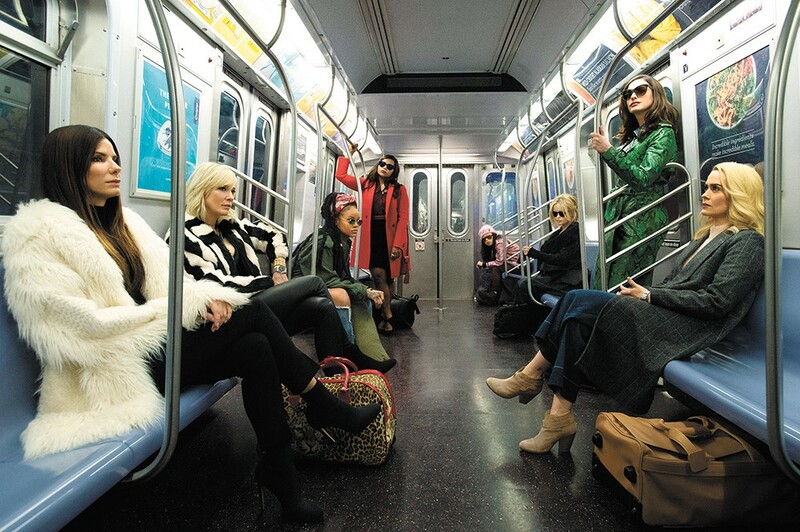 Ocean's 8 continues the franchise's penchant for cool comic capers with all-star casts. When Warner Bros. executives were promoting Ocean's 8 at CinemaCon, the movie-theater industry's annual trade show, they touted it as part of the "Ocean's Eleven universe," which seems like a surefire sign that it's a corporate branding exercise first and a creative project second. And sure, there may be a hint of calculated intellectual property extension in Gary Ross' spinoff from Steven Soderbergh's popular Ocean's heist-movie trilogy, but the film itself is so stylishly fun and buoyantly self-confident that it's hard to resent its salesmanship. Like its con artist characters, it keeps you entertained while taking your money. Soderbergh's star-studded films, beginning with Ocean's Eleven in 2001, had a similarly breezy, glamorous quality, and 8 continues in the same vein, with Soderbergh onboard as producer and his longtime friend and occasional collaborator Ross (whose credits range from The Hunger Games to Seabiscuit) directing and co-writing with Olivia Milch. The original trilogy starred George Clooney as master thief Danny Ocean, putting together a crew of fellow criminals to rob multiple Las Vegas casinos (along with a detour for some European capers in the series' belabored low point, 2004's Ocean's Twelve). 8 introduces Sandra Bullock as Danny's sister Debbie, who opens the movie in the same way her brother did in Eleven: being released from a stint in prison and reuniting with her best friend and partner in crime. Here, that's Lou (Cate Blanchett), who's at first skeptical but quickly comes around to Debbie's plan to mount a robbery at the prestigious Met Gala, an annual event at New York City's Metropolitan Museum of Art that draws celebrities and fashionistas adorned in pricey jewels. In particular, they plan to steal a $150 million diamond Cartier necklace that will be around the neck of famous actress Daphne Kluger (Anne Hathaway) — as long as they can manipulate her into wearing it. Cue the gathering of the team, which includes jeweler Amita (Mindy Kaling), hacker Nine Ball (Rihanna), pickpocket Constance (Awkwafina), fence Tammy (Sarah Paulson) and has-been fashion designer Rose Weil (Helena Bonham Carter), whose need for career and financial redemption provides the impetus for the plan. That plan is just complicated enough to be enticing, while not so convoluted that it becomes hard to follow. The pleasure of a movie like this is in watching charismatic actors in gorgeous clothing pull off ridiculous maneuvers, and that's exactly what Ross delivers. There isn't a lot of suspense as the heist plays out, but as anyone who's seen any of the other Ocean's movies knows, these aren't stories about criminals who get caught. That's not to say there aren't a few delightful surprises, but this is a movie more about good-natured camaraderie than thrills and twists. As Clooney and Brad Pitt did in the previous movies, Bullock and Blanchett make for a wonderful pair, with the relaxed vibe of old friends who know all of each other's best and worst tendencies. Among the supporting cast, Hathaway is the highlight, giving Daphne a balance of vanity and intelligence that becomes fully evident in the movie's most entertaining (and yet inevitable) plot development. Ross isn't a cinematic maverick like Soderbergh, but he maintains a brisk pace, and he throws in a few split screens and other flourishes to keep things visually interesting. The original print version of this article was headlined "Hollywood Heist"